Sound "A very neutral, lively and forward sound that brought excitement to the music." "Nothing was unduly highlighted or underemphasized with the Red Wave cords in my system." There was "a substantial lowering of the noise floor," and cymbals were "energetic, crisp and shimmering, displaying extended decay." "Despite the general liveliness of the highs on all of the recordings I played, they were always delicate and free of brightness and glare." Features "The Red Wave contains three beefy 10-gauge conductors, each comprising 462 strands of silver-coated OFHC copper. Each of the conductors is tightly spiraled in order to reduce inductance" and "they are separated from each other by cotton fibers." "Above the conductors rests a copolymer dialectic that helps to reduce incoming differential-mode noise.... On top of the dialectic sits two shields that reduce external noise." "Over the outer shield rests a binder wrap that's followed by the Red Waves distinctive red jacket." Use "I can foresee uses for each cord with particular components -- especially high-current power amps for the DH Labs Red Wave." Value "Like the other DH Labs products I have auditioned, the Red Wave provides top-notch sound at a reasonable price, particularly when compared to the prices charged by the companys competitors." I have never been much for strangely colored stuff. It is therefore not surprising that I have stayed away from things such as green beer and blue hair. As a kid, my neighbor had a dog with a black tongue. I avoided that dog like the plague. In light of this, I viewed the DH Labs Red Wave power cords, complete with red cable and connectors, with some suspicion. Much to my surprise, however, I found their appearance to be unobjectionable and [gulp] even attractive. But no matter what they looked like, the Red Wave cords would still have to live up to the DH Labs reputation for high-end performance at prices that dont come close to breaking the bank. Indeed, one thing that I have always admired about the company is that many of its products are so reasonably priced that you could actually recommend them to non-audiophiles without their thinking you are mentally unsound. At a base retail price of $700 USD per meter cord, with $100 for each additional meter, the Red Wave joins the companys Power Plus Studio Reference power cord, which retails for $220 for a meter length. While not chump change, the Red Wave's price is low enough that there is certainly no shortage of power cords that sell for two to three times more. The first thing you will notice about the Red Wave, other than its color, is that it is relatively light and flexible. I say "relatively" because you must consider that the Red Wave contains three beefy 10-gauge conductors, each comprising 462 strands of silver-coated OFHC copper. Each of the conductors is tightly spiraled in order to reduce inductance -- the conductors resistance to rapid changes in current level. They are separated from each other by cotton fibers. Above the conductors rests a copolymer dialectic that helps to reduce incoming differential-mode noise. This type of noise enters the cord through the power line, perhaps from the electric company or your neighbors hair dryer or refrigerator. On top of the dialectic sits two shields that reduce external noise. This includes airborne radio frequency interference (RFI) that is radiated into the cord from, for example, other cables that sit close by. The first shield consists of a dense braid of tin and copper. The second shield consists of a layer of conductive foil and a drain wire. Over the outer shield rests a binder wrap that's followed by the Red Waves distinctive red jacket. The Red Wave cords I received for review were outfitted with optional Oyaide 079 plugs and IEC connectors, which add $50 to the price of each cord. Standard are the gold-plated Wattgate 330i plug and 350i IEC connectors. The Oyaide 079 conductors contain male prongs and female IEC connections that are made of deoxidized phosphorus bronze. This metal, unlike pure copper, is corrosion resistant and is said to maintain its natural hardness over thousands of insertions. To increase conductivity, the connections are polished several times and electroplated with two microns of 24k gold. They are then polished two additional times. This, according to Oyaide, increases contact and decreases microarcing and vibration, which can cause noise and signal smear. The bodies of the connectors are made from polybutylene terephthalate that is 30% glass filled. This material provides rigidity as well as resonance and thermal stability. It also absorbs unwanted high frequencies. The glass fill further strengthens the material. The outer red barrels are made from polycarbonate, a material that is extremely sturdy and difficult to break. As such, it is used in a variety of applications, including eyeglasses and bulletproof windows. I know what you are thinking. Dont try it! The Red Wave is said to be appropriate for the "most demanding" audio components and video displays. Indeed, the cord would likely be a nice addition for almost any audio component. Nonetheless, based on its thick conductors and low inductance, it would seem to particularly benefit power amplifiers, which often require high current and do not contain regulated power supplies, as do preamps. After experimenting a bit, I used one Red Wave power cord with each of my MartinLogan Vantage electrostatic speakers. This is typically the place, along with my amplifier, that benefits the most from a good power cord. The third Red Wave cord was assigned to my Halcro MC50 power amp, occasionally rotating to my Nuforce P-9 preamp and Marantz DV9600 digital player. In order to excise any break-in demons, I ran the cords for about 150 hours before doing any critical listening. Connectors are such an important part of a power cord that their sonic signature is hard to repress. If a connector sounds warm, the power cord stands a good chance of sounding warm too. This is true even where, as here, the conductors are plated in a metal that often imparts a cooler sound. From my experience, the Oyaide 079 connectors typically sound very warm, soft and fairly laid-back. In fact, I can state that listening through the 079s is a bit like looking at the world through rose-colored glasses. In light of this, I expected that the Red Wave would display a decidedly warmish bias and a laid-back perspective. However, it didnt take very long to discover that the tendency of these power cords is the opposite -- a very neutral, lively and forward sound that brought excitement to the music. First up was Jorma Kaukonen's Blue Country Heart SACD (Columbia CS 86394). The album, which features such bluegrass legends as Sam Bush, B�la Fleck, Jerry Douglas and Byron House, is a collection of rural blues hits from the 1920s and 1930s. Vintage acoustic instruments were used for the recording, some of which were almost 100 years old. On every track of this album, from the highest notes of Sam Bushs mandolin, Jerry Douglass Dobro, and B�la Flecks banjo, to the lowest cords of Byron Houses string bass, nothing was unduly highlighted or underemphasized with the Red Wave cords in my system. This tonal neutrality was particularly evident on Kaukonen's earthy vocal, much of which is located in the lower part of the midrange. I have heard some power cords that go a bit too far in overemphasizing this area, causing the voice to sound a bit muddy, sometimes even boomy. The Red Wave beautifully exposed the rich, crackly warmth of Kaukonen's voice, particularly highlighted on the track "Big River Blues," while still maintaining grace and definition. Loudspeakers  MartinLogan Vantage with Descent subwoofer. Power amplifier  Halcro MC50. Source  Marantz DV-9600 universal player. Interconnects  DIY, made from DH Labs cable and Bocchino Audio RCA connectors. 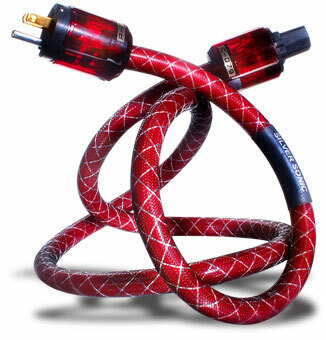 Speaker cables  Synergistic Research Tesla Accelerators. Power cords  Synergistic Research Tesla (various), Shunyata Research Python Helix Alpha. Power conditioners  Synergistic Research Powercell, PS Audio Noise Harvesters, DIY parallel filter. Accessories  DIY isolation rack, Bright Star Audio and Black Diamond Racing isolation devices, Shakti stones. Also, much to my surprise, the Red Wave didn't help create a laid-back perspective at all. It brought the musicians to me, maybe two to three feet closer to my listening chair than I was accustomed. I am not talking about soundstage depth, although the size and dimensionality of the soundstage were not at all lacking and were about what I expected. It was more that the rear of the presentation followed the front and took a few steps forward, thus providing a first-row listening experience. Of course, tonal balance and soundstage placement are matters of personal taste and system matching. But could the Red Wave bring home the sonic bacon when it came to far more objective criteria, such as dynamic prowess, noise reduction, detail retrieval and transient handling? Blue Country Heart again, this time "Prohibition Blues," which features Byron Houses upright string bass. This instrument reaches not only into the lower bass area but can go as far down as 35Hz, where the sub bass begins. Frequencies in this area are felt more then heard and high current is required to reproduce them. With the burly Red Wave cords pumping current into my system, it was now able to produce exceptionally deep bass, and I felt the strong, penetrating energy of Houses notes. I then focused on the region around 40-160Hz, where notes can easily become cluttered and ill-defined. On "Prohibition Blues," the Red Wave cords were detailed and clear, uncovering the leading edge of bass notes with great clarity. The notes were also afforded more tonal individuality, thus contributing to the increased musicality of the recording. These improvements were brought about by a substantial lowering of the noise floor, something that was easy to discern with well-recorded acoustic music. Next up was Carmina Burana, which is based on a collection of 13th-century poems authored by of a group of renegade monks who rebelled against the Church. As made clear in their poems, they were more interested in debauchery than prayer. The performance that I had on hand was rendered by Donald Runnicles and the Atlanta Symphony Orchestra and Chorus (Telarc SACD-60575). Due in part to the use of an explosive bass drum, there is perhaps no better piece of music -- and no better recording -- with which to test a power-cords ability to convey the power necessary for rapid transients and current demands. Also, the works liberal use of suspended and crash cymbals would provide me with an opportunity to hear what the Red Wave could do in the very uppermost frequencies. With the Red Wave cords, the jolting sounds of the bass drum in "O Fortuna" was heavy, while at the same time it had fast and forceful impact. In truth, I expected these types of improvements, given what I had heard with upright bass. What I did not expect was the extent to which the Red Wave improved bass-drum decay. Each reverberating ripple of the drums skin was now discernable, the last of which faded into a background of complete darkness. Again, this was undoubtedly made possible by an extremely low noise floor. On the high end of the spectrum, cymbals in "O Fortuna" were energetic, crisp and shimmering, displaying extended decay. Despite the general liveliness of the highs on all of the recordings I played, they were always delicate and free of brightness and glare. They really never called attention to themselves for the wrong reasons. The Red Wave brought "O Fortuna" right to the middle of my listening area. But most of all, it added significant weight to instruments, causing, for example, the bass drum to take on a rather imposing character. This greatly contributed to my systems ability to "shock and awe," a quality that is absolutely necessary to reproduce this piece of music faithfully. Also, the chorus took on a focus and presence that were as substantial as those of any number of high-end power cords that I have used. All of the DH Labs products that I have tried in the past have performed well above their pay grade. I therefore had no qualms about comparing the Red Wave to the more expensive, well-regarded Shunyata Python Helix Alpha power cord, which retails for $1100 for a six-foot length. Each of the two cords displayed stellar performance. However, most noticeably, the Python edged out the Red Wave in the area of lower-bass control. It somehow managed to improve slightly on what was, by all accounts, an excellent showing by the Red Wave on Byron Houses upright bass in "Prohibition Blues." While the Red Wave beautifully rendered the notes of the bass, the Python bettered it by a technical smidgen, displaying more control and authority. This reminded me why the Python is so good. It provides an exceptional low-level foundation for which to lay the midrange and high frequencies. Note that while I would characterize both the Red Wave and the Python as being primarily neutral in tone, the Python, unlike the Red Wave, displayed very slight midrange richness. The Python was also less forward in its presentation than the Red Wave. Does this mean that the Python is worth almost 30% more than the Red Wave? Only you can answer that question in light of your system and budget. I can foresee uses for each cord with particular components -- especially high-current power amps for the DH Labs Red Wave. They say that the apple does not fall far from the tree, and that is certainly the case with the DH Labs Red Wave. Like the other DH Labs products I have auditioned, the Red Wave provides top-notch sound at a reasonable price, particularly when compared to the prices charged by the companys competitors. In fact, considering all that the cord has to offer, I have no doubt that there are many cable manufacturers that would place a substantial four-digit price tag on it and still be able to proclaim that it was competitively priced. Yes, the Red Wave hit all the audiophile marks. It brought increased dynamic excitement and energy right to my listening chair, while also decreasing noise and substantially improving focus and detail. These are not improvements that are easy to achieve. But in simple terms, it just helped my system sound great, making me want to play album after album, sometimes when I should have been doing other things -- like sleeping. It is therefore without hesitation that I add the Red Wave to my list of recommended power cords. Now, pass me a green beer, will ya? Price: $700 USD per meter length, $750 per meter length with Oyaide connectors.